Web and cloud application security exposures and email-based attacks continue to plague enterprises of all sizes, industries, and geographies. To tackle the threat, organisations have typically relied on multiple single purpose solutions to address each channel of risk. They’ve ended up with a proliferation of products, which complicates security and compliance, rather than simplifying it. By unifying email, web, and cloud security with multi-factor authentication, CensorNet offers the freedom, visibility and protection that businesses need to navigate the threat landscape while unlocking the benefits of the cloud by enabling safe adoption of a wide range of apps. Has the info security industry lost the plot? While the bad guys collaborate, swap secrets, rub elbows - the ‘good guys’ are disassembling, isolating, patenting. Where you might hope to find vendors working toward coherent, ‘joined up’ technologies, instead you find that the comprehensive solution has fragmented into a thousand pieces. The time has come for coherence, simplicity and clarity… We know that email is the most common vector for external attacks, and that a rogue URL injects the killer malware or siphons off your secrets. We understand that public cloud services may increase the risk of your organization unwittingly or deliberately compromising your clients’ sensitive information. So how about a solution that recognises the interplay between those three, spots the threats and remediates them? From just the one policy engine, and through a single pane of glass? Join Richard Walters, Chief Security Strategist, CensorNet for a webinar on Wednesday, 28 June at 1500 BST where he’ll discuss the beauty and simplicity of a coherent, unified, 360-degree view across web, email and cloud applications. Remember the days when IT had full control of which applications were used across your organisation? Today’s reality is that business moves faster than ever before, and teams need to be agile and able to easily collaborate together. 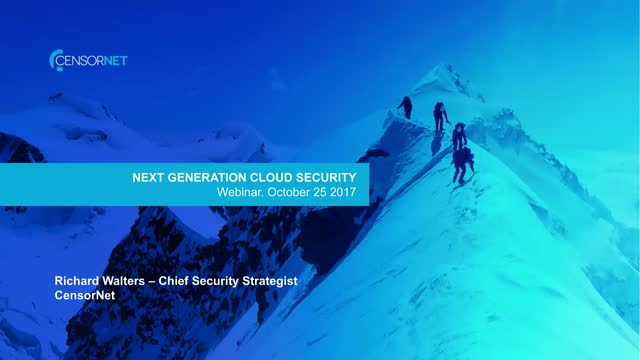 How do organisations embrace the advantages of the cloud while keeping security and compliance tight? Data and security breaches related to cloud services and apps were much more widely reported in 2016. The increased use of cloud-based business applications has allowed organisations to maximize the productivity and efficiency benefits that are part and parcel of cloud architectures. With access to data no longer as restricted as it once was, risks naturally increase. Denial of access is not an option. Instead, the goal is to allow appropriate access and prevent bad outcomes (i.e. data breaches) from arising. The Internet’s black market means big business for cyber criminals who relentlessly steal personal and corporate data. Many organizations are still relying on the 20-year-old technology behind two-factor authentication for protection; however, it is simply not up to the challenge. Modern threats require a modern authentication approach, specifically one that can deliver a session and location-specific code to a user’s mobile device in real-time. This webinar will discuss the merits of CensorNet's Multi-Factor Authentication system; a more intelligent and user-centric authentication that allows an increase remote access security without sacrificing convenience. This webinar is ideal for security professionals. The use of Cloud Services, Apps and BYOD help make your business more responsive. So simply shutting them down is not an option. Find out how you can take advantage of the flexibility and agility that the cloud offers and secure your network for anyone, anywhere, any time on any device. This video demonstrates how Cloud Application Control (CAC) allows businesses to see what cloud apps are being used and what files are being uploaded into them. How CensorNet's Cloud Application Control is helping schools implement the new Prevent policy and monitor students for signs of radicalisation. Designed to act as an umbrella for web security across head office, branch office and remote workers, CensorNet HWS provides a single pane of glass to discover, analyse and control web activity across multiple networks and devices. Uniquely, the CensorNet HWS platform uses a proxy-less approach which significantly reduces latency, preserves the user’s real IP address and maintains privacy by allowing the browser to maintain direct communication with the designated web server if the request is allowed. This results in a fast and unobtrusive experience which does not hinder productivity or cause frustration to end users.